In order for our Lord to be born from a human mother, she needed to be a holy and sinless vessel to carry the New Covenant. We celebrate her holy, immaculate conception on December 8th (and celebrate her birth 9 months later on September 8th). 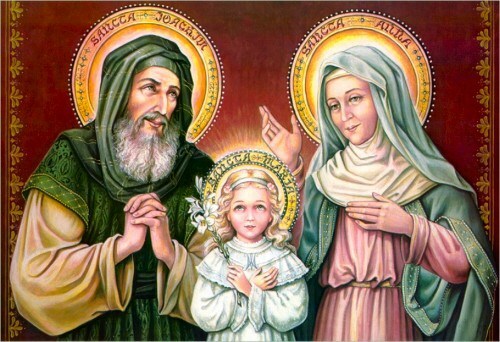 Mary was conceived by human parents, St. Anne and St. Joachim. They were both faithful servants to God, and through their holy union, conceived Mary. God and Jesus chose Mary from among ALL women, past, present and future to become the holy vessel, the New Ark of the Covenant, to carry Our Lord. Only someone who was uncorrupted by sin, could carry a holy God, therefore she was saved by the grace of God at her conception, whereas we are saved after death through the sacrifice of her Son. Celebrate the Ark of the New Covenant just as the Israelites would celebrate the presence of the Ark, through the celebration of the Holy Day Mass. Pray that Mary will also welcome you into her Ark and carry you to new life through Jesus, her Son.